Our customer Tony's Chocolonely is known for their mission to make 100% slave free chocolate a reality. They recently implemented a pilot with blockchain technology for traceability in their cocoa supply chain. In this guest blog, you can read about their experiences and conclusions. A must read! To create a slave free chocolate industry, we’re dependent on an important ingredient: a traceable cocoa bean. 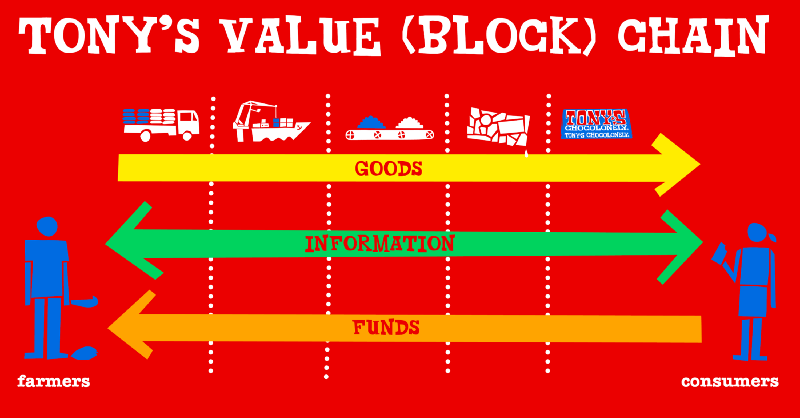 We’d like to think of our supply chain as a shared value chain, where each and every involved party is informed of the exchanged values. Hey, sounds a bit like that hype all tech-savy’s are talking about these days, doesn’t it? Blockchain! We were curious what blockchain could mean for mission and so we implemented a pilot. We tell you all about it. Ready? Therefore, in 2015 we started first working on a traceability and collaboration platform that allows us to build this flow of information and monitor the flow of beans from Africa to Europe. Sharing this information helps the different partners to work together and feel connected to Tony’s value chain and its purpose: to eradicate child labour and modern slavery. The platform provides transparency of incoming beans, beans traded between actors of the supply chain and beans arriving at the end of the chain, the processor. To professionalize the platform Tony’s implemented the Beantracker: a digital platform based on software made by Chainpoint, our traceability IT partner. The Beantracker spans from cooperatives, via local traders and the international trader to processers. All actors have the responsibility to enter their information on the platform and share it with all others. In exchange they receive all other relevant information. Since the birth of Beantracker we’ve been following technology developments that would be useful for the Beantracker. In 2017 blockchain technology really emerged as a tool for managing traceability. In the meantime, at the other end of the city of Amsterdam, Accenture Technology was developing blockchain technology and looking for opportunities to pilot. Matthijs and Jogchum proposed to do a pilot with us. They interviewed Lean and submitted their idea of “slave free chocolate by blockchain” in an internal competition at Accenture. And they won! During Tony’s FAIR in Amsterdam we had the opportunity to train all involved actors of the pilot: Augustin and Martin from our local trader Ocean and Oumar from our partner cooperative Socoopacdi. We worked directly together with Rachelle the blockchain developer of Accenture. This live training turned out to be a major contributor to the success of the pilot: data was entered timely and correct and direct feedback when the system was not operating as expected ensured technical issues were resolved quickly. Blockchain use for traceability is still in its early stages, lots of ‘proof of concepts’ projects, not so much operational blockchain-run value chains. During the pilot we experienced some glitches and technical design challenges ourselves. The Gartner Hype Cycle estimates 5–10 years of development required for Blockchain to reach plateau, see below. The big challenge for any traceability technology (blockchain or Beantracker) is getting the data from the physical world onto the digital platform. That is also the big advantage of blockchain-tech for Bitcoin, which is 100% virtual. A physical value chain, with bags of cocoa without scannable tokens, is a completely different thing. Getting the data virtual is the name of the game. That’s why Tony’s we use a user-friendly always-up Beantracker that is designed to support and enable correct and timely inputs. Blockchain can be especially effective in a transactional environment with little trust and many anonymous actors. Tony’s value chain partners know each other very well. That’s why we designed a private blockchain (none other than the distinguished actors were allowed on the platform) with Tony’s as the supporter and coordinating third party. Tony’s drive is to have all chain partners stay connected and encourage everyone to invest in direct relations which in this case supports data integrity. Beantracker is designed with the possibility for it to become the industry standard with many other entities joining the platform to monitor and take responsibility for their cocoa value chains and when more people start to join the movement for slave free chocolate, and the number of users in the eco-system grows, blockchain might become increasingly interesting. There is important potential in blockchain technology for traceability worth investigating. We have a functional and operational traceability platform that performs the same service with a different technology. Together with ChainPoint our partner for Beantracker we will follow blockchain developments closely as well as other relevant technological developments like Artificial Intelligence (AI) and Internet of Things (IoT). And when appropriate applications arise, or the eco-system readiness grows, we will integrate blockchain technology into Beantracker. We are open to other parties to further explore other technologies (AI) and the application for traceability. In short, the pilot was a great ride, we learned a great deal and had some fun along the way. Need more information on ChainPoint and blockchain?